Posted: Thursday, December 13, 2012 1:21 pm | Updated: 1:25 pm, Thu Dec 13, 2012. In a broadcast journalism class her sophomore year at Ladue Horton Watkins High School, senior Samantha Weil fell in love with storytelling. When she decided to enroll in the class, Samantha was simply trying to meet her required practical arts credit. However, the Congregation B’nai Amoona member had no idea what kind of opportunities learning broadcasting would present. After toying with documentary-style filmmaking for her sophomore year final exam, she connected with the medium. As a junior, she continued her involvement with broadcast journalism through Ladue View, the high school’s monthly news program. As Samantha got more involved with the program, her love of telling longer stories developed into a true passion. “At the end of my sophomore year I was given the assignment to make a 90-second video about 9/11,” Samantha said. “I re- membered a family friend who was in the second tower when the plane hit and he had an amazing story. I interviewed his wife but really wanted to do a piece on him, but I realized how much had to be left out because the video was so short. Samantha’s talent for movie making runs in the family. Her older brother, Joseph Weil, attends film school at the University of Southern California. Samantha considers her brother one of her main influences. In fact, it was Joseph who suggested that Samantha take broadcast journalism during her sophomore year. Without Joseph’s advice, Samantha’s passion for broadcast journalism might have gone undiscovered. If movie making is genetic, the Weil family is living proof. Joseph supports his sister and endorses the many benefits that broadcast journalism affords. He knows the many tricks of the trade and has gained a lot of knowledge through his experience in projects and courses. With all of her work, advice and accomplishments behind her, Samantha prepares to enter college next fall and hopes to earn a degree in broadcast journalism with a concentration in documentary production. She aims to one day become a documentary filmmaker. However, that has not always been her plan. 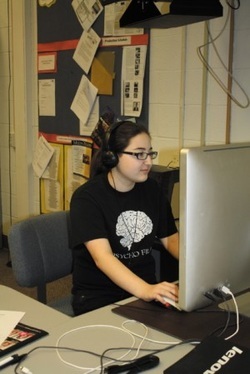 While she is involved in some media projects outside of school, Samantha does most of her work at school where she has access to the equipment. Because Ladue View requires independent work that takes place outside of class, Samantha sees the program as more of a production than a class. Through various independent studies, Samantha has strengthened her connection to Judaism through creating films representative of her personal beliefs. Samantha’s documentary on the March of the Living, a yearly march that commemorates the death march during the Holocaust by celebrating Judaism while mourning those lost, is her biggest film feat. She filmed the documentary during her own March of the Living experience, where she spent a week in Poland before continuing to Israel. Beyond her work so far, Samantha has a bucket list of documentary stories that she hopes to tell during her career. Her main goal is to help people from all different backgrounds gain hope and inspiration from the stories of their peers. “I really believe that everybody has a story to share and it is a journalist’s responsibility to find those stories,” Samantha said.